Plan for your 2019 H1B CAP ... NOW! We applied for well for 100 H1Bs in 2018, with more than half of them being CAP cases. Here are some of the takeaways from our experience, and the reason why you should start planning now if you wish to apply for 2019 H1B CAP. As you may already be aware, the USCIS has increased the amount of scrutiny significantly this year. And like we have said in a number of our previous posts, the USCIS did not have to come up with new rules, they just are enforcing the existing rules a lot more stringently. In the process, the number of RFEs and eventual denials have increased significantly. Your employer will have to establish that there is a bona fide employer-employee relationship with you. Running your payroll in itself is not sufficient. They are looking for additional evidence, as you can see from the screen shots of a recent RFE below, which are typical of most RFEs. 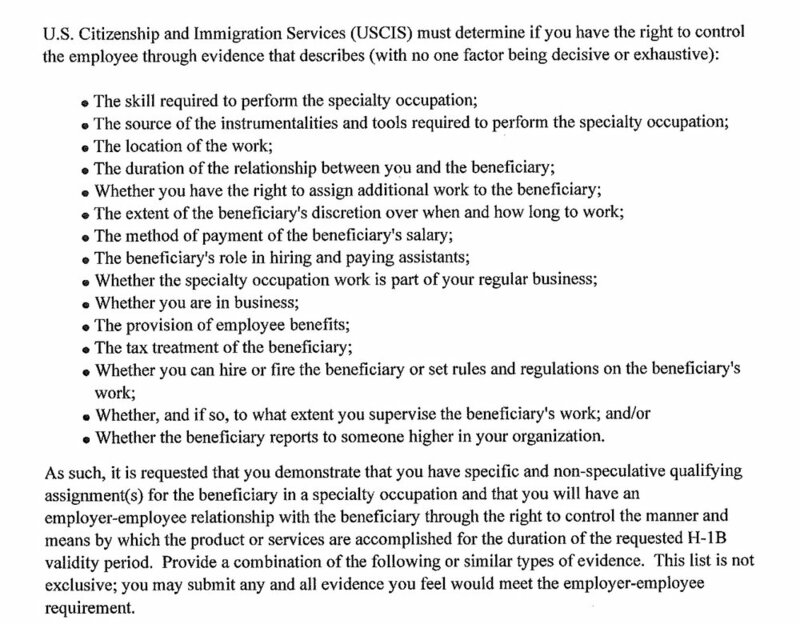 As you can see, the USCIS is expecting the employer to do more than just run the payroll. So how do we handle this? We make sure that all our employees are paid the correct LCA wages. We plan for each employee well ahead of the cap season to make sure that we are in compliance. We pay them all the time, not just while they are billing. Benching is not legal, and the USCIS can easily sniff it out from your year-to-date pay/taxes and also from your federal quarterly filings. So when some employers offers your good % pay, don’t be lured into it. You will have issues down the road during your H1B and GC. Not to mention, STEM OPT employees are also required to be paid. We do periodic performance evaluations, and document the process and the results very well, which clearly indicates a employer-employee relationship, not a staffing relationship. There is a clearly defined organizational and reporting structure. We have established processes where our consultants regularly report to their supervisors, which could be provided as documentary evidence that we are supervising our employees. We provide a lot of classroom training, equipment, relocation expenses and a number of other benefits, all of which can be provided as documented evidence of a true employer-employee relationship. Since we bring them on early during the OPT, and establish an employment history, the USCIS can see that the candidate may have changed projects, but was always under our employment. We have well over a hundred employees, a a long history of H1B and GC applications. So we are a well-established business as far as the USCIS is concerned. It is also important that we have the ability to assign work to you, and hire/fire you. The fact that we have you work on multiple projects shows that we can assign you work. And we always obtain client letters that confirm that we control your employment and that we have the right to hire and fire you. This is only possible because we have long-term relationships with a number of our clients. H1B is a specialty occupation; and therefore, the onus is on the employer to prove that the job is a specialized occupation that required a minimum of bachelor’s degree. As you can see, just a job title like “Java Developer” is not sufficient. So how do we handle this question? We provide fairly detailed and technical job description with client-specific project information for each H1B applicant, that clearly qualifies as a specialty occupation. Most employers create generic job descriptions that tend to lead to denials. Our long-standing relationships with our clients help us in obtaining letters from our clients endorsing the detailed job details and the special skills required for the job. We also obtain expert letters from industry experts as needed to prove that the job is a specialty occupation. These letters are usually very expensive to obtain, but we consider these a worthwhile investment. Based on a memo released earlier this year, the USCIS is granting H1B validity only for the duration of the project as demonstrated by the submitted documentation. See the RFE screenshot below. We have heard of people get H1B approval for as little as 3 months (not years), because the client project documentation showed an end-date in 3 months. Given our client relationships and extensive network of potential projects, we are able to place our employees on long-term projects with reputed clients that are able to provide us documented evidence (Purchase Orders, Work Orders, Statements of Work) with clear project start and end dates that will help us obtain long-term H1B approval for multiple years. If you are currently on CPT, the USCIS wants will question if you are maintaining your F-1 status. Did you engage in a full course of study as defined by the USCIS to maintain a valid F-1 status? Is your employment a required part of your CPT course curriculum? While these questions look simple enough, you will have to provide specific documentation from both your school and employer to successfully respond to this question. We have handled a number of CPT cases and successfully obtained H1B approvals. As you can see from the above RFEs, H1B is a fairly complicated process. An inexperienced or ill-equipped employer can easily jeopardize your chances of approval. Not to mention, it takes time to carefully plan and stategize the right approch to apply for your H1B. So if you are looking to apply for 2019 H1B CAP quota, you should find the right employer now, not in a few months. Call us today if you want to discuss how we can help you!